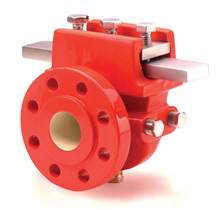 The Single Chamber Orifice house and accurately position the orifice plate for differential pressure measurement. The fittings allow for fast and efficient removal and replacement of the orifice plate, without physically removing the meter from the line. The OrificeMaster utilizes the "590" Integral Plate which is impossible to locate the wrong way to the flow direction, therefore eliminating large error uncertainties. The OrificeMaster can be installed on horizontal or Vertical Pipelines.